The American Heritage Center (AHC) at the University of Wyoming is really on a digitization roll! We’ve just digitized and uploaded about 220 documents regarding the Heart Mountain Relocation Center and a 1949 film titled “Wyoming and Its Natural Resources” from the Lester C. Hunt papers. 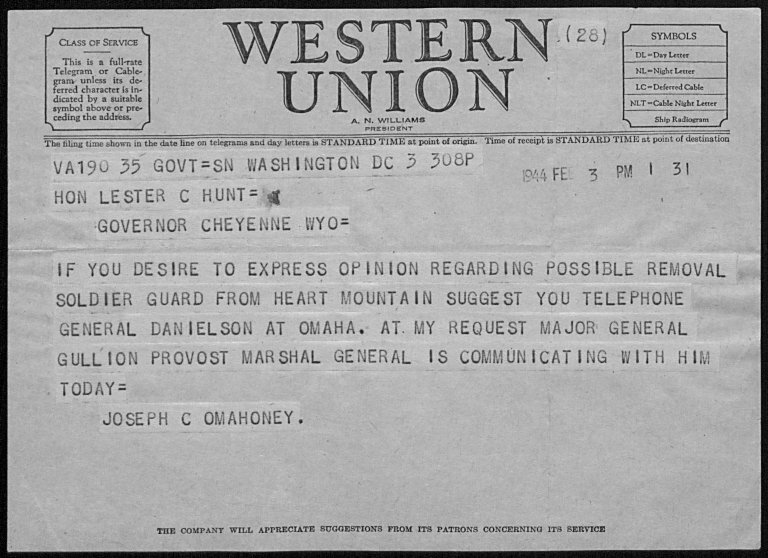 Telegram to Lester Hunt from Joseph O’Mahoney, Lester Hunt Papers, #270, Box 1, Folder 13. University of Wyoming, American Heritage Center. Lester Calloway Hunt was the 19th governor of Wyoming from 1943 to 1949 and a United States senator from 1949-1954. He earned a D.D.S. in 1917 from St. Louis University and established a dental practice in Lander, Wyoming, in 1919 and continued his practice until 1934. In 1932 he was elected to the Wyoming House of Representatives as a Democrat and also served two terms as secretary of state from 1935-1943. As Wyoming’s secretary of state, Hunt designed the state’s iconic “bucking horse” automobile license plates. Hunt was elected governor of Wyoming in 1942 and 1946, and U. S. senator in 1948, a position he held until his death in 1954. This collection contains subject files and other materials related to his political and personal life. Links to digitized items and additional information about the Lester C. Hunt papers can be found in the collection inventory. If you have any questions, please contact Jamie Greene in the Digital Programs Department at jgreene@uwyo.edu or 307-766-3704. This entry was posted in newly digitized collections, Under-documented communities, Wyoming history and tagged Heart Mountain Relocation Camp, Lester Hunt papers. Bookmark the permalink.